David Segal rumors on Daily Dose that the Hotel Sierra, proposed for Washington Street is dead. David thinks it is time for the perpetual cycle of propose flashy new building for site of current historic or semi-historic building, get variance, get approvals, tear down building, cry poor, and park cars there for decades instead needs to stop. I have to say David, I agree. 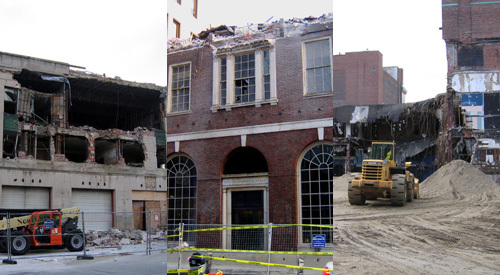 I think that we, as a microblogosphere, could make a coordinated push to pass an ordinance to make these purposeless demos of historic buildings far less likely. There are a million models in other cities and towns (typically just requiring that a substantial bond be posted, that would be kept by the city if the project doesn’t happen). It think Messrs. Yurdin and Wood might be especially sympathetic, and that there’s a general recognition on the Council that these reforms are needed. I say Seth, Cliff, get something written up and I’m all about supporting it.